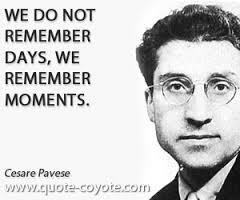 Cesare Pavese is widely regarded as one of the foremost men of letters in twentieth-century Italian cultural history, and in particular as an emblematic figure: an earnest writer maimed by fascism and struggling with the modern existentialist dilemma of alienated meaning. Little known in the United States, Pavese was profoundly influenced by American literature, and, when official censorship closed his mouth, he would use his position as a translator and editor indirectly to bring into Italy messages of freedom and new ideas from English-language authors. Most Italians first encountered Herman Melville, James Joyce, William Faulkner, Charles Dickens, Gertrude Stein, John Steinbeck, John Dos Passos, and Daniel Defoe in Pavese’s translations, and also encountered their influence, and echoes of their meditations, in Pavese’s own highly accomplished body of novels, short stories, and poems. 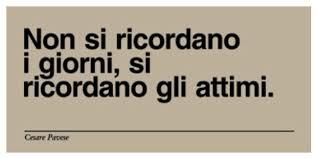 And you can read a selection of Pavese’s poems here. You could do worse than start with ‘The Country Whore‘. ‘The richness of life lies in memories we have forgotten.’ , Feb. 13, 1944.